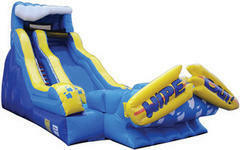 We just replaced the wipeout with a new one, its one of our most popular slides! As this water slide inflates the first thing you notice is the bright colors and sheer size of this inflatable. Once this water slide is full inflated, you will notice the bright yellow hand painted broken surf board that sits In front of the splash down pool. This water slide rental stands 2 stories tall and has a wave cresting at the top that appears as if it was crashing down on you. You enter this slide from the front left and climb to the top to experience the misting hose that keeps the slide wet. Once you sit and are ready to slide down this huge water slide, push off and enjoy the speed of the slide. In the middle of the water slide there is a large hump that gives an exhilarating thrill to your ride down the wipeout water slide. At the bottom you land in a splash down pool, which is large enough to get wet but small enough to use minimal water to fill it up. Your feet stay clean because you can enter the stairs from the pool area and race back up to slide once again. This water slide rental can accommodate children as small as 6 yrs old all the way up to teens and adults under 225lbs. The set up area for this water slide rental is 40 feet in length x 20 feet in length x 24 feet in height to give ample clearance. This is one of the largest and most fun water slides in the Tampa Bay Area. Don't Wipeout add an interactive game to your event and tables and chairs. Also check out our party packages we update them monthly.